What can I say, I’ve always wanted to try my hand at making macarons, but for many many reasons I did not get around to it until this weekend. As I explained to my dad while he was intently watching me pipe out my macaron mixture, macarons have a reputation on the internet for being famously impossible, yet ridiculously photogenic. The number of flavour combinatons you can put into a macaron is endless, from normal-sounding sweet flavours like chocolate & caramel, to savoury flavours like olive & beetroot. And then there’s just the outright weird ones, like stout & pretzel, or mushroom macarons. 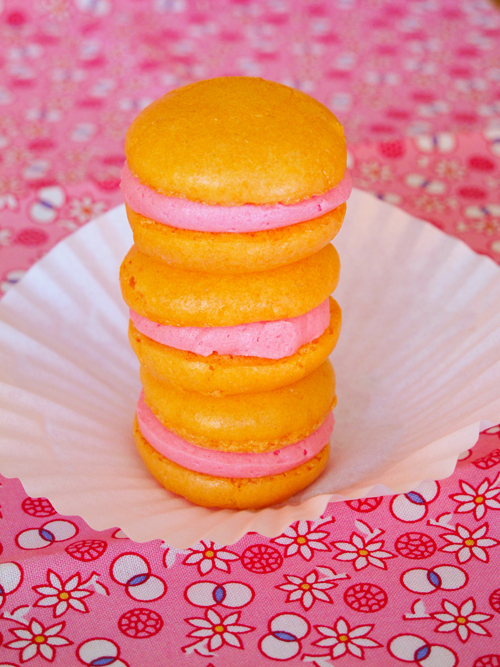 Whatever flavour combination you choose, there is a myriad of tips & tricks online that will give you “foolproof” macarons. When I was researching yesterday to find a good recipe to use, the more recipes I read & the more “tips” I found, the more I thought macarons must have been invented by accident. Really, there’s no way someone would have done all this on purpose. First, you’re meant to use egg whites that have “aged a day”. I can just see some French apprentice chef finding a bowl of eggwhites leftover from some delicious Crème brûlée the day before, and thinking “Sacre bleu! Are these still in here?? I’d better use them in something!” Secondly, I’m assuming macarons were invented long before electric stand mixers, meaning this poor apprentice would have whisked those old eggwhites by hand. And then, realising he still needed to add the icing sugar and almond meal: “Merde!! I’ve just done all that whisking for nothing! Because folding in all the dry ingredients will compress all the air bubbles I just whisked into this meringue making it runny again!” Yeah I followed the instructions for this, but couldn’t really see the point in making meringue runny again. But, it worked, which is “the point” I suppose. Anyway. I made macarons. I don’t really have anything of value to add apart from they’re really not that hard, if you weigh everything out like an obsessive-compulsive, and follow the recipe to the letter. 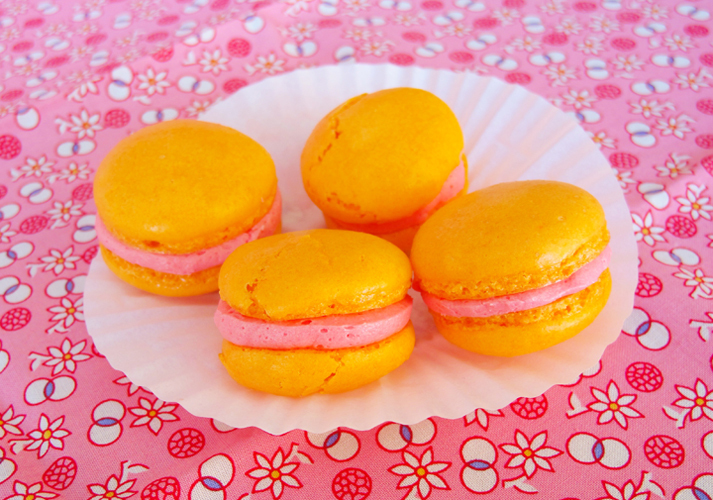 I used this recipe, though it doesn’t make as many macarons as I was expecting, so they turned out a little, er… fluorescent. Yes, Wilton’s colour pastes are quite concentrated. I will double the recipe (or half the colouring) next time around. Additionally I didn’t leave them out on the bench quite long enough (or, I remembered to turn the oven on at the start) so a few of them cracked. Understandably, I didn’t use those in the photos. These macarons didn’t last long at all. Probably about half an hour after I finished making them. 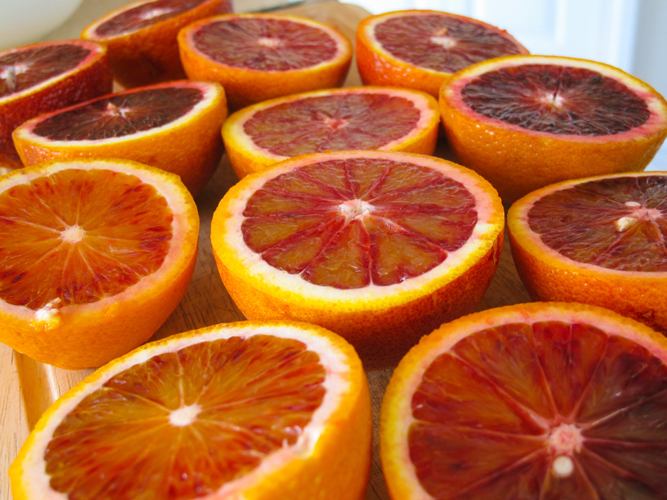 Orange, especially blood orange, is one of my very favourite flavours to use in things, so whenever they’re in season I can’t resist in buying a couple of kilos. I made blood orange curd Friday night (which tastes amazing but wasn’t a very good texture. I used a recipe that includes egg whites, which leaves bits of cooked egg whites in the curd. I could have strained it but…. who can be bothered doing that?) which I used for the buttercream. I have plenty of buttercream left so might have to make another batch of macaron shells to use it up! Something tells me my dad won’t mind one bit. 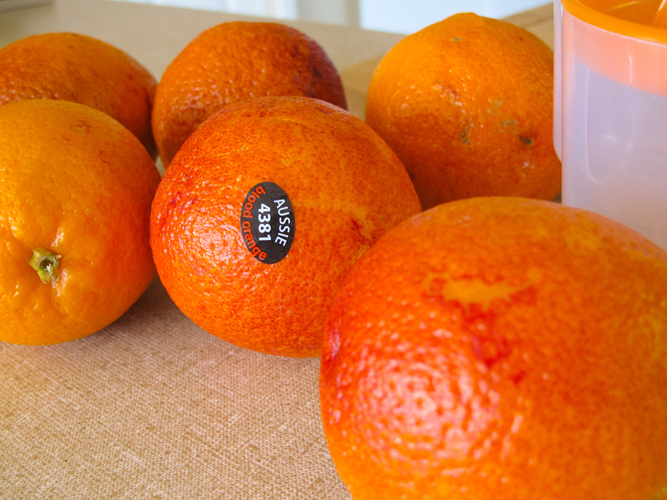 This entry was posted on October 6, 2013 at 11:18 am and is filed under Sweets. You can follow any responses to this entry through the RSS 2.0 feed. You can leave a response, or trackback from your own site. That looks wicked. I’m still too scared to make my own!